You may be interested in printing your images for your food styling or food photography business for several reasons. You may want to print some large photos for sale or display, or perhaps you want to print a line of greeting cards. 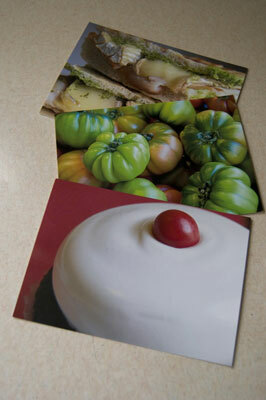 And even a business card with an amazing food image on it is worth at least a thousand words. Although it may sound a little retro, seeing hard-copy photo images is really pleasing, especially because we’re so used to seeing photos only onscreen these days. The high end of printing food images most likely involves a plotter. A plotter is a really, really big printer, with a width that ranges between 24 to 60 inches wide (see the following figure). The paper typically comes on a roll that’s fed through the plotter. 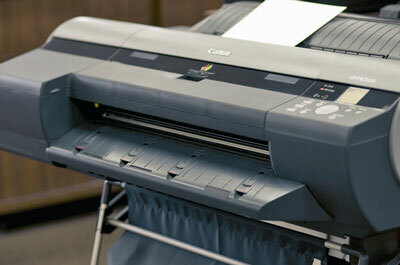 A plotter or large format printer is the tool to use for high-end photos. And, oh, the papers you’ll find for plotters: matte finishes, glossy finishes, even pearl finishes. You can also obtain some absolutely beautiful fine art papers that look gorgeous with food photos. Or you can even print on canvas or other cloth-like materials. A plotter is a really good option for printing your photographs as art for a restaurant, gallery, or art show. You might also print a large image of work previously done for a client as a thank-you gift. Some really great printing companies will take the time to evaluate the color and tone of a digital file and print large images with care. You may be able to find someone local to your area, but you can find some great services online as well. When you find a company that really cares about printing quality images, hold on tight to it! Not to be outdone by the big guys, a number of great, smaller photo-printing companies have cropped up over the last several years. They print things like photo business cards and postcards (shown in the following two figures), greeting cards, and so on. 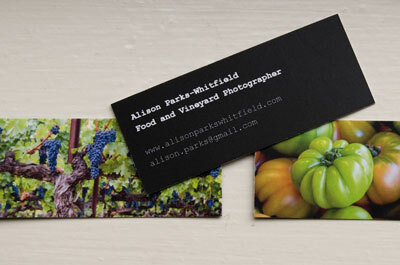 Business cards with food images are great advertising tools. Postcards can be sent out as thank-you notes and reminders. These cards can be sent to clients as thank-you notes and reminders, or they can be handed out as advertising tools. Some of these small printing companies are even connected with photo-sharing sites, which is quite handy. For the most part, the quality of smaller photo-printing services is low cost but still quite good. And if it’s not, let them know! A reputable company will be happy to try again for you. If you’re interested in submitting your photos to an existing greeting card company. Peruse the greeting card sections at various stationery-type stores in your area and check the back of the card for the publisher info. If you find a company that creates cards somewhat close to your aesthetic, contact it to see whether it’s currently accepting new photographers’ work.